I’m Retreating with the Doris Southard Lace Guild this weekend in Dubuque. It starts tonight but I decided to take the day off so I could get packed and decide what I’m going to work on. Good thing, because here I am at 8 a.m. and I have no idea what I’m going to do! 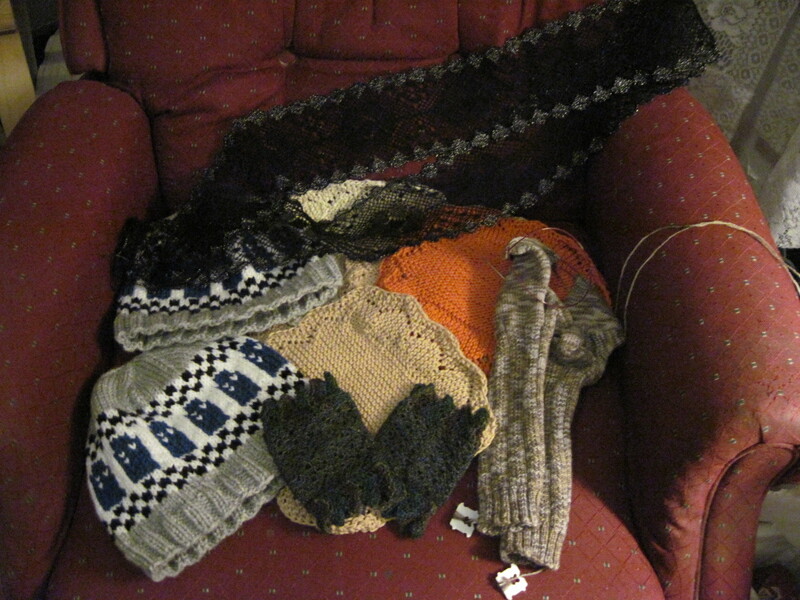 Last year I had the big scarf project planned, but this year I’m just dithering. Nothing on my pillows but an ornament, so I think I’m going to finish that and try to make a few more. 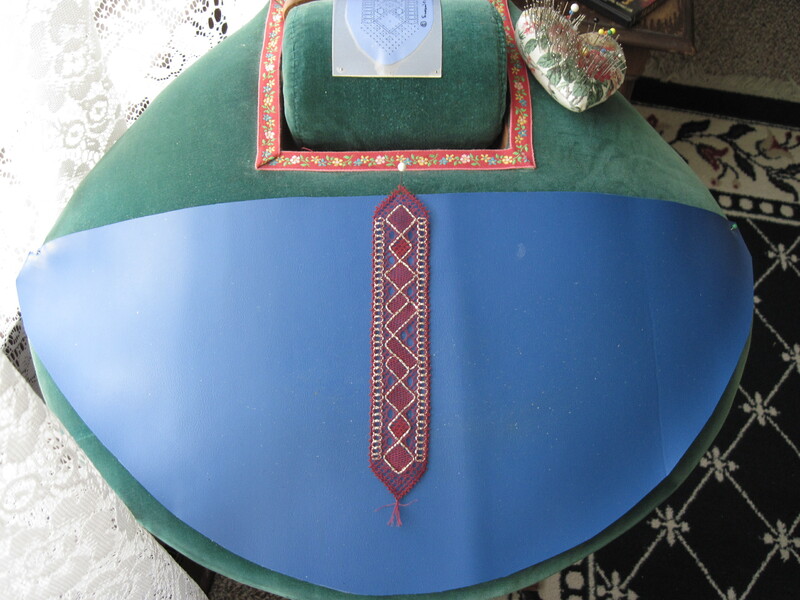 I’m getting excited; finished sewing the lace on my nametag this morning. The nametag is very old (1995 or 1996?) and the lace is very well-traveled. 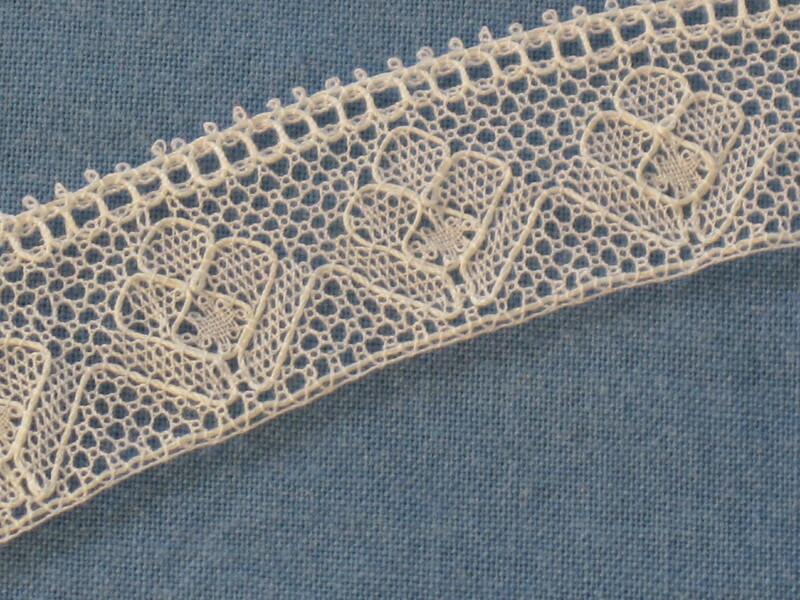 It’s a piece of Ipswich lace that I made and it went to Japan for the OIDFA conference a few years ago as a part of the American lace display. It just happened to fit around my nametag. 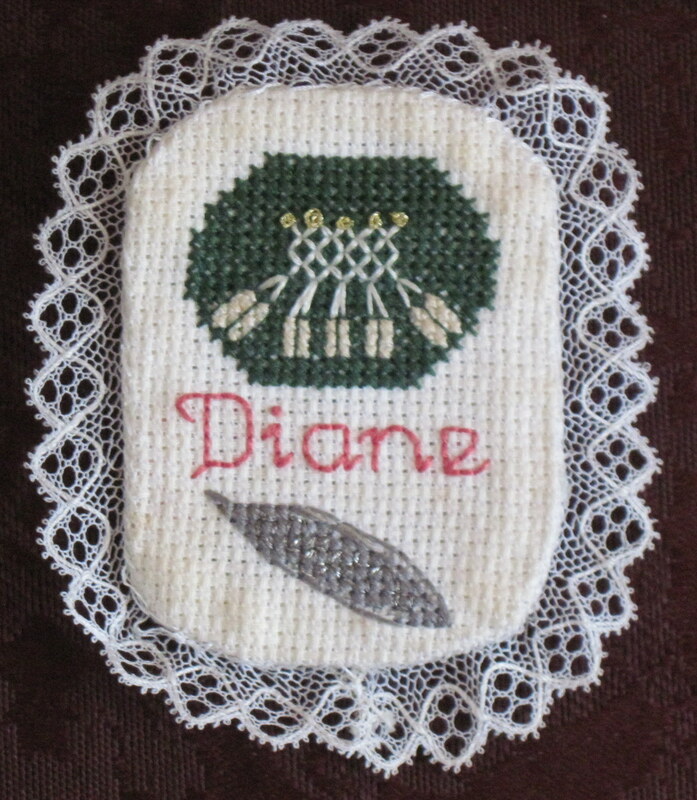 I love the nametag because it has both a bobbin lace pillow and a tatting shuttle on it to show both my passions. Hopefully I will have some finished lace to show after the weekend! 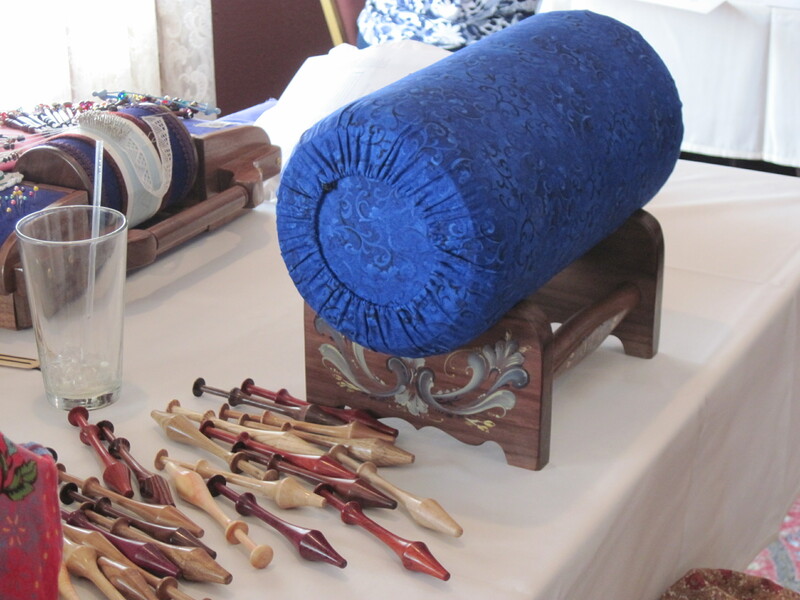 Had a wonderful time at the Doris Southard Lace Guild retreat that was held in Dubuque last weekend. Started a new project, a ‘s Gravenmoerse bobbin lace scarf. 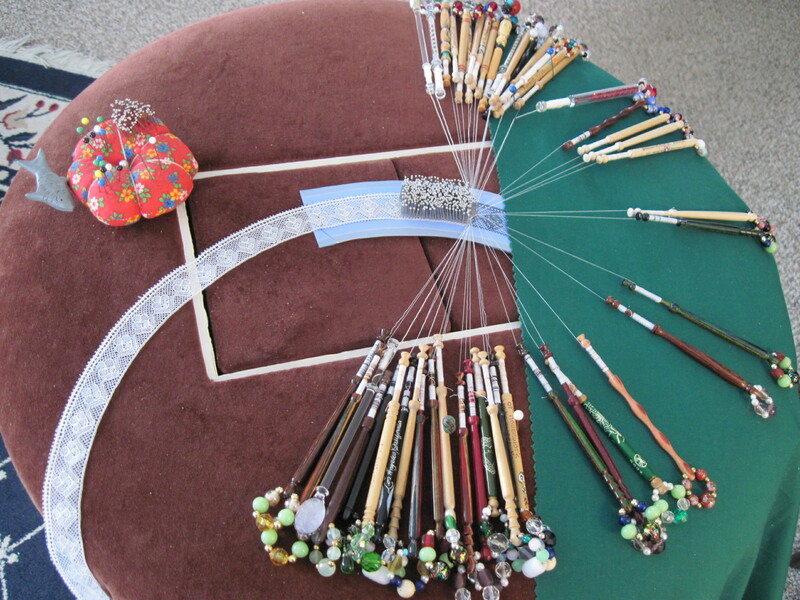 Fourteen members were there and we got a lot of lacemaking done. I’ll do a more in-depth report on the retreat later. So excited! 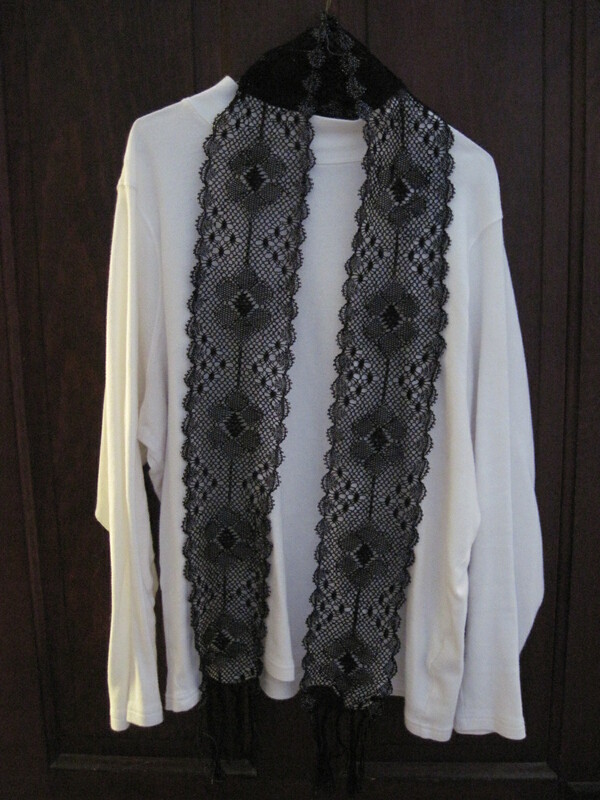 Going to the Doris Southard Lace Guild retreat in Dubuque tonight and lasting through Sunday. I have a mountain of stuff packed and can’t wait to put some quality time in on my projects. 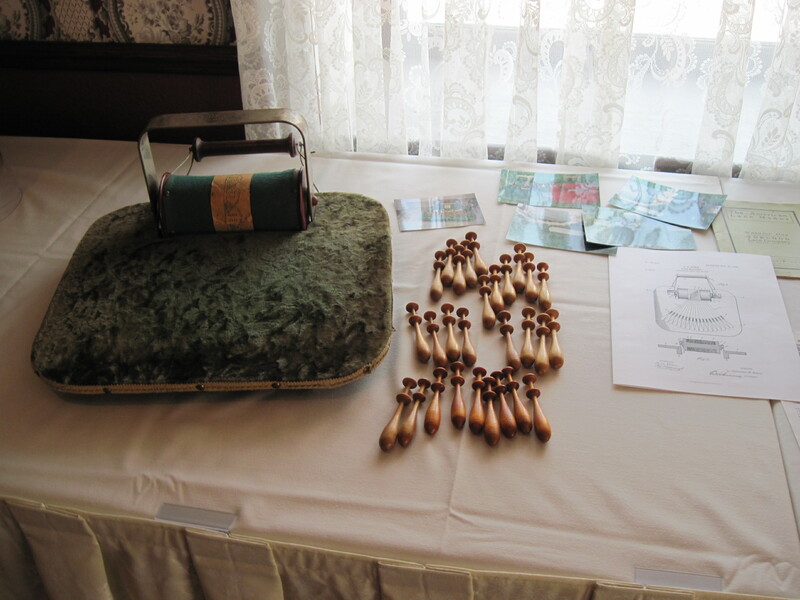 The Doris Southard Lace Guild meeting was in Galena today and I did a short presentation for the group about my Princess lace machine. We had a nice mix of people, with the local members all there, members from Moline and Cedar Rapids, and some visitors from Galena, Dubuque and Rockford that made the drive to see us. Some of us met for lunch before the meeting which was held in the Desoto House Hotel. The room was great, with good light. I think we did a lot of chatting and sharing, but some lace was made. 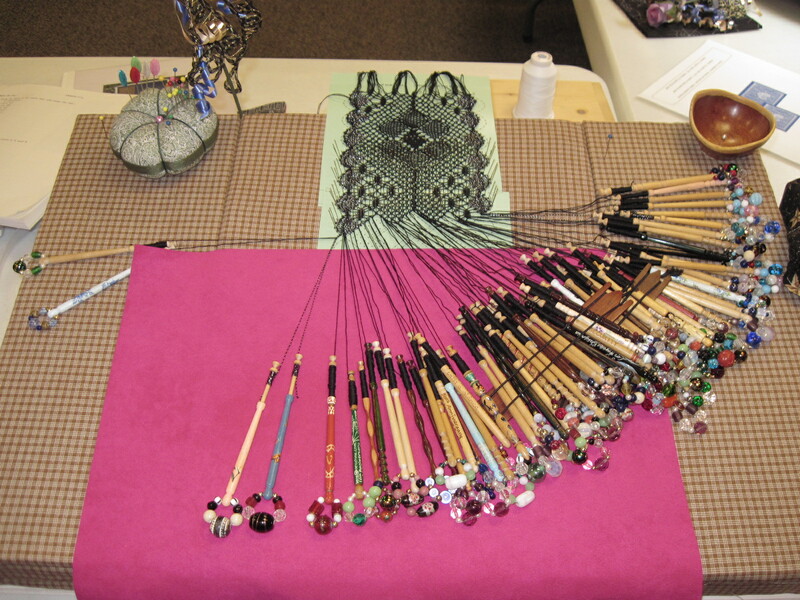 My Princess lace machine with bobbins. Jan’s new bolster pillow. She has a very talented hubby. 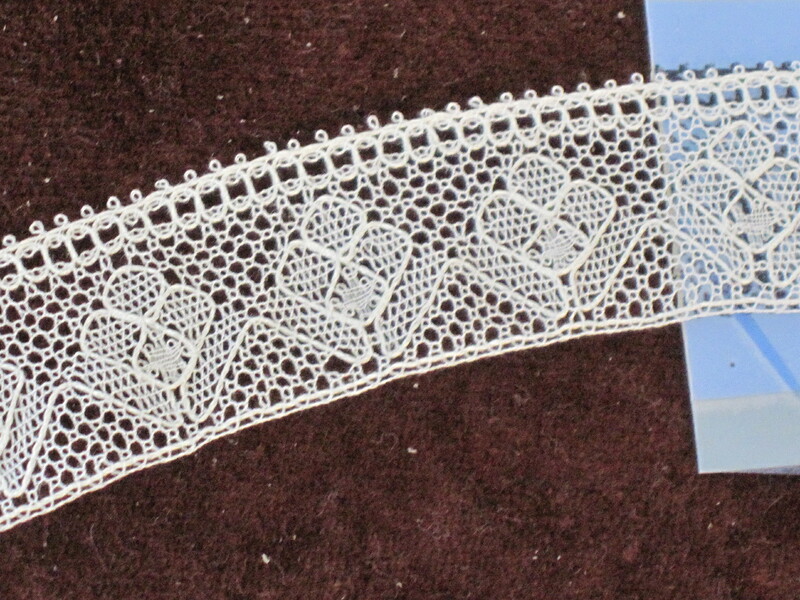 I am making progress on my Romanian Point lace doily; just 4 more sets of bars and centers. I’m getting tired of making these wrapped bars; I think next time I will mix it up a little and not leave them all for the end! Also, I FINALLY finished the lace for my fan. 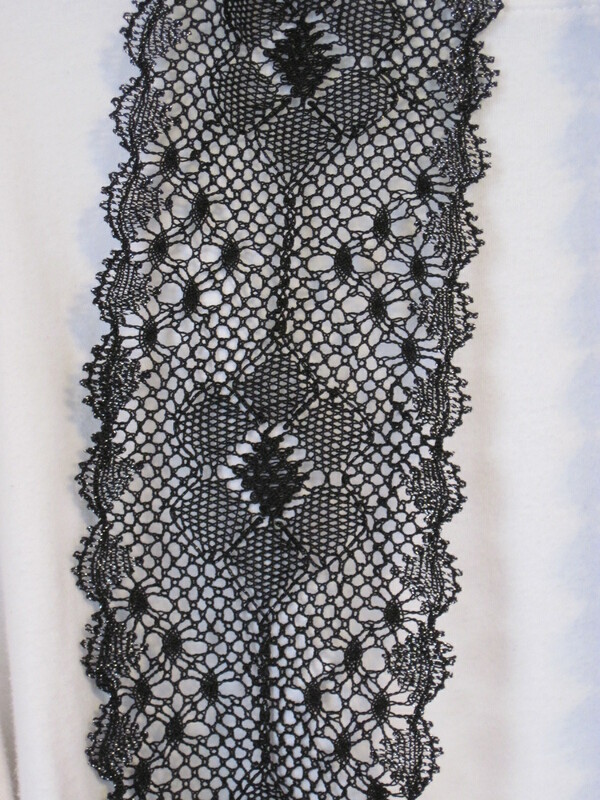 This lace was started at the 2010 Doris Southard Lace Guild retreat. Even though I estimated it takes about an hour to do one repeat of the pattern, and there are 38 repeats, there’s no excuse that this took a year and a half to finish. Regardless, it looks great, I love ‘s Gravenmoerse lace, and now I just have to mount it on the fan. 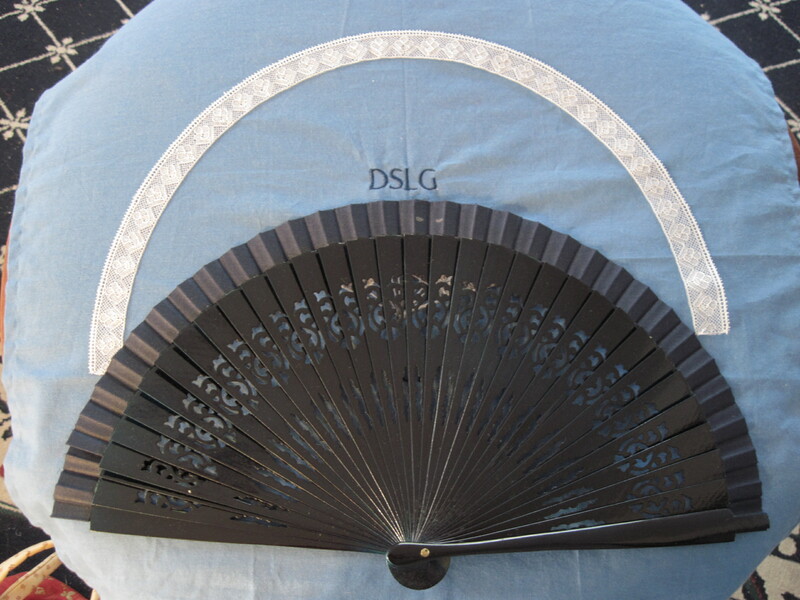 The lace was designed to fit this fan and it looks like it will be a perfect fit. 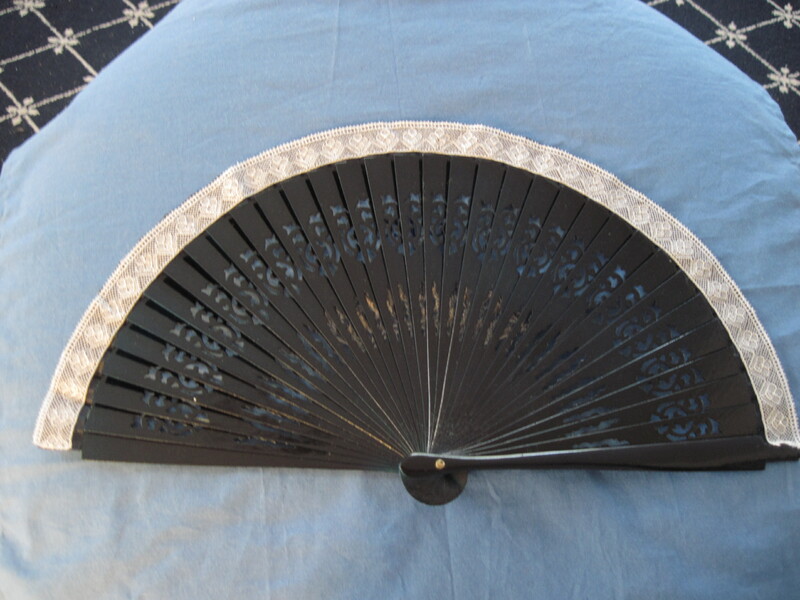 I’m going to stitch it to the ribbon at the top of the fan sticks. The only thing wrong with that is the white stitches that will show on the back. I have an idea about how to hide that, do you have an idea for me to consider? I haven’t been doing much stitching lately; too many good books to read. But I have a square Romanian Point lace doily that is very close to finished, some knitted face cloths that just need the ends woven in, a finished bobbin lace bookmark that is going in the mail to my exchange partner, and a pair of knitted socks that have just gotten interesting. I guess that’s a fair bit, but it still seems like low numbers to me. 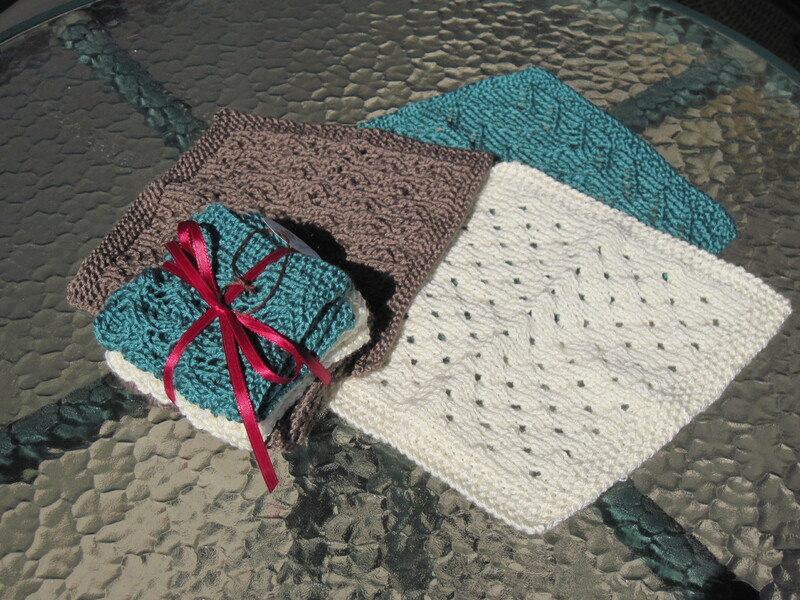 Here are the face cloths that I’ve been knitting. The Spa yarn is bamboo and acrylic and it has a really nice, soft drape and hand, even when wet. I also finished a bobbin lace bookmark that is going to be sent to my exchange partner in England. I hope she likes it. This is one of my favorite patterns, designed by Susan Wenzel. 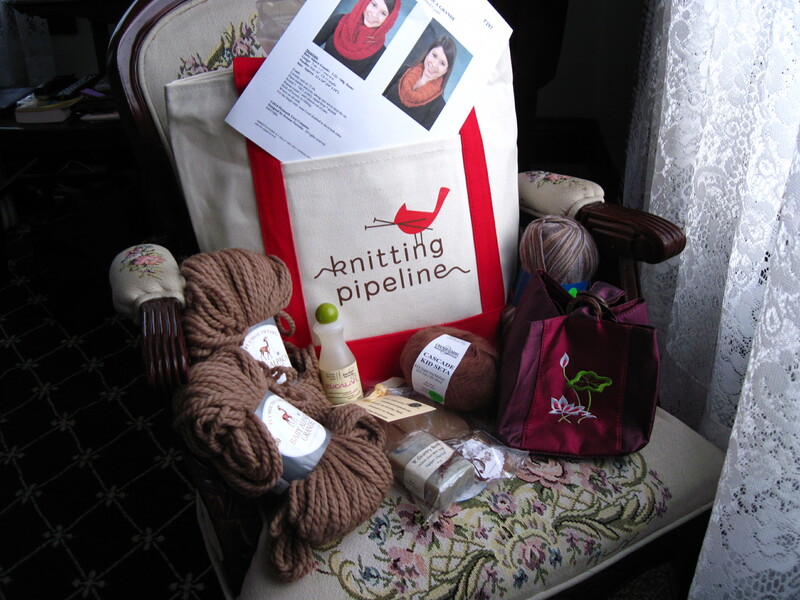 Audrey and I had a wonderful time at the Knitting Pipeline Retreat in Washington, IL last weekend. We left Rockford Friday morning and wound our way down there, visiting 4 yarn shops in the process! I didn’t buy much, but found some sock yarn (of course) for Ted and a pattern booklet for me. The shops were all sweet, and best of all we ran into retreaters at each one. Even in the restaurant for lunch we were identifying the Knitters as they came through the door. I didn’t get much knitting done; I was too busy talking, watching the break-out sessions, and scoping out what everyone else was doing. I did take my portable lace pillow and gave a quick demonstration to some people around me. 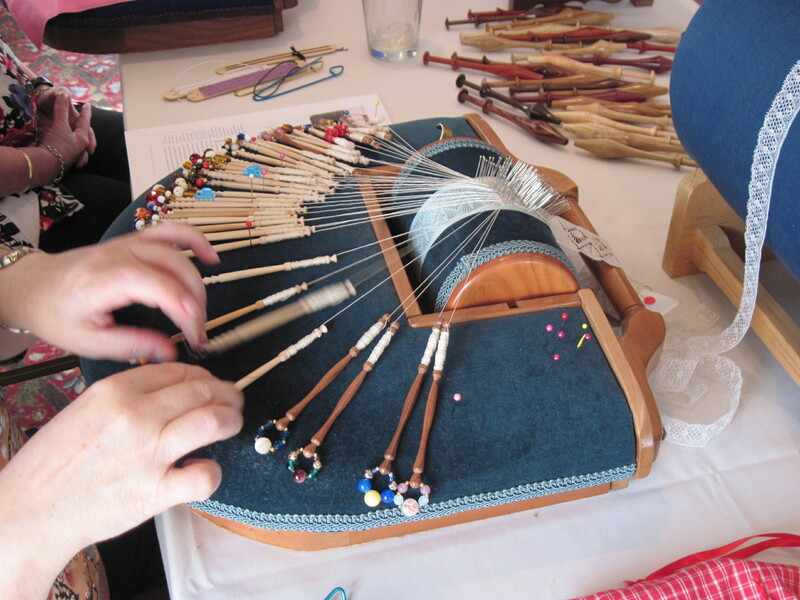 It surprises me every time I hear that someone has never seen or heard of bobbin lace before! I even won two door prizes, lucky me. Here is my loot from the weekend. We came back to Galena Saturday night and Audrey finished two of her projects by the end of the weekend. We met great people and had the best time! Can’t wait to do it again next year. I can’t believe I’m still working on this fan project; I only have about 3 inches left to do! It’s gotten to the point where it’s hard to work because the bobbins are starting to hang off the edge of the pillow. With all the snow on the ground outside, the reflected light makes my living room very bright on the weekend mornings. 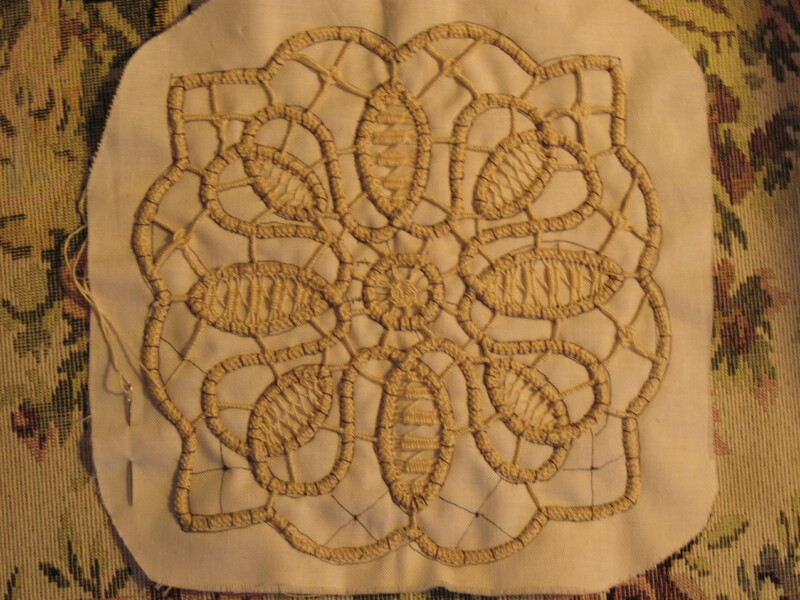 It’s been wonderful for working on my bobbin lace for the fan. 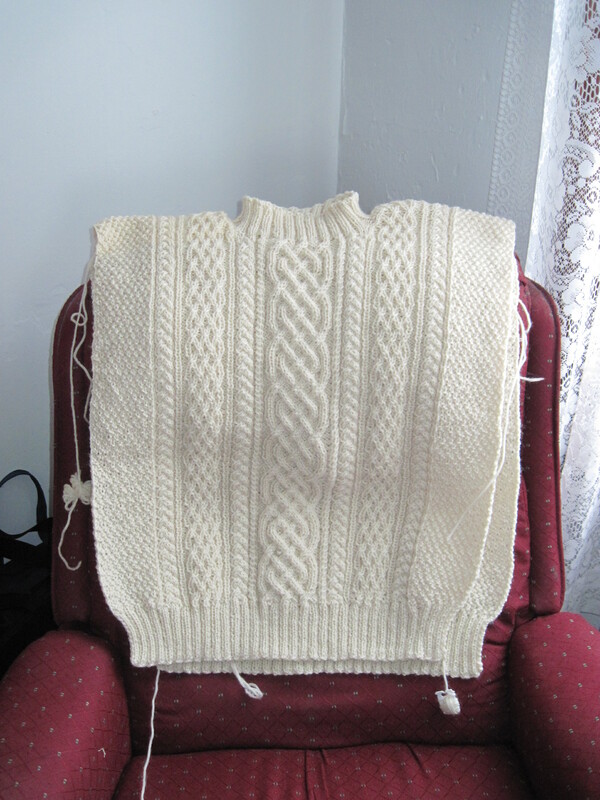 I’ve passed the halfway point and there are only about 9 or 10 inches left to finish. I timed how long it takes to do one repeat of the pattern and it’s down to about an hour and 15 minutes. I feel like I’ve really gotten into the groove of this pattern. How does that dust get on the pillow when I keep it covered all the time? 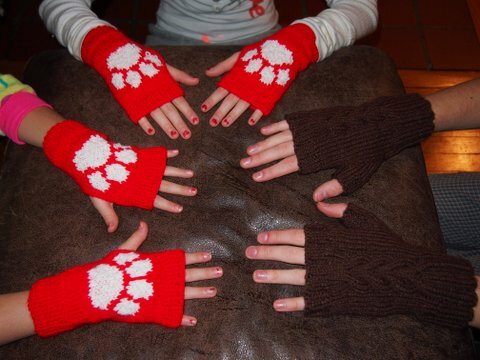 Here is my selfish knitting project for January. This is the Inishturk sweater from Lion Brand Yarn. It’s a cabled fisherman’s sweater that I’ve had my eye on for some time and Ted gifted me with the yarn for Christmas. I have absolutely loved knitting this sweater. Every row has cable crossings and surprisingly the 16-row pattern repeat was easily memorized. It was a little tough to get going because the pattern is written out and I’ve gotten used to charted patterns, but I just love everything that is going on in it. I’ve just started the first sleeve and hope to be able to wear it yet this winter. With the weather we’ve had and the projected cold temps in the forecast I think that won’t be a problem! 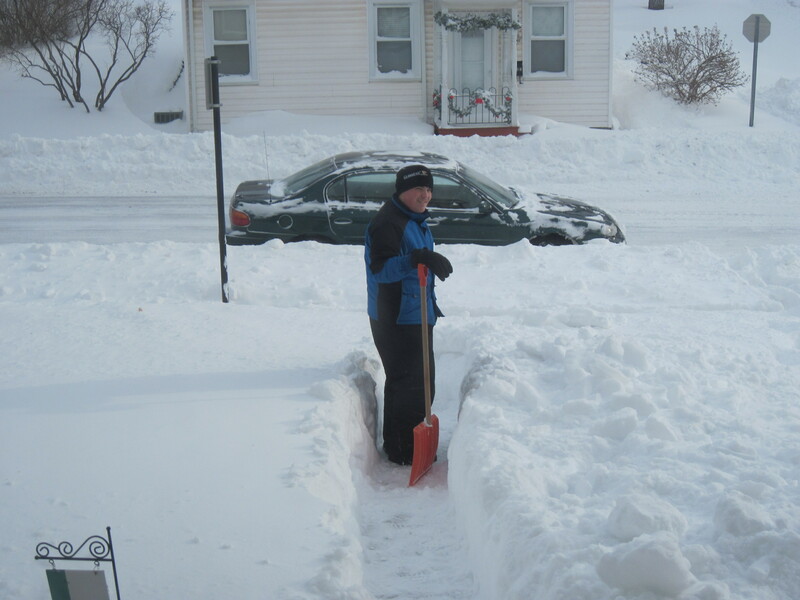 We survived the Feb. 1 blizzard and had everyone had some shoveling stories to share. 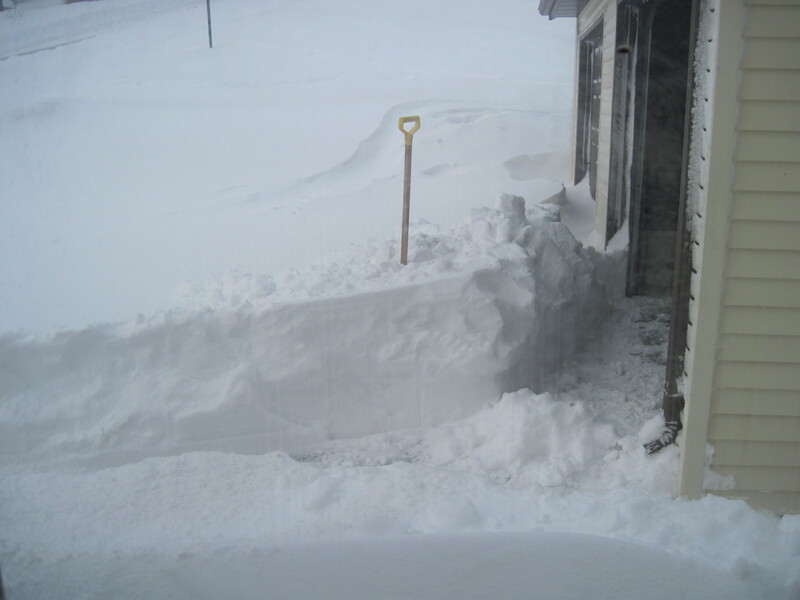 Ian, Ted, and the neighbors did an excellent job and got us cleared out very early. 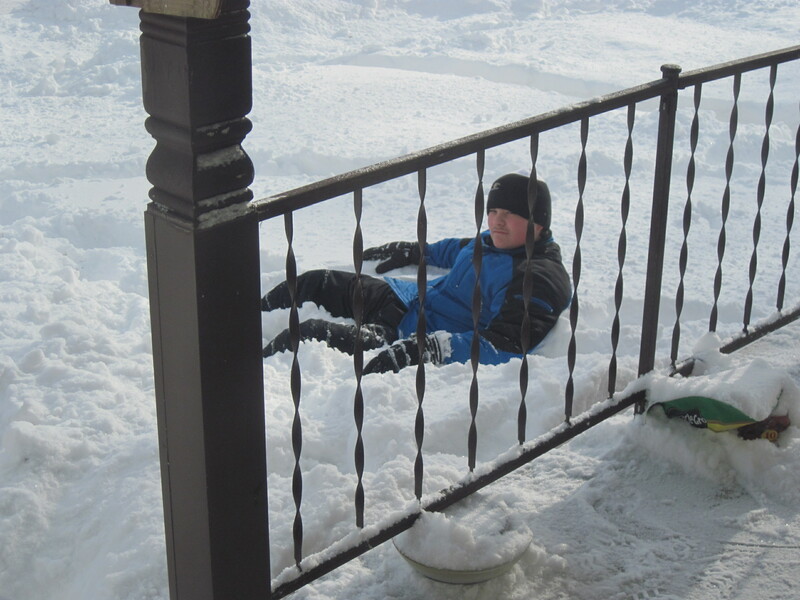 Ian enjoyed his two snow days and I enjoyed my day off work as well. Primo knitting time!